Jeff Fenner had an up and down kind of career, but it's come crashing to a halt. Police are investigating him, he owes money to the wrong people, and he doesn't have much of a future. His sister commits suicide, but that isn't like her at all. It leads him to try to investigate the death, and he meets Ron Pool, the reporter that covered his sister's death and thinks others might be related. In addition, there is also the relatively new member Holly Barnes. She's troubled and involved in the same self-help group that seems implicated in a string of suicides eerily like his sister's. The worst part? Holly seems to be next. As with Earl's other books I read, chapters are short and add to the sense of urgency throughout the novel. We know from the start that Jeff's sister Marilyn didn't commit suicide, but the identity of her killer isn't known. The description of "Save Our Lives," the self-help group that Holly joins, is modeled off of 12 step groups and psychotherapy; the pitch from its members outright state that. The words are very kind and make a logical kind of sense, but then Art, who comes across as intrusive and kind of creepy from the start, starts bringing up Aleister Crowley and bringing Holly to a separate group. Knowing this is a thriller makes those actions even more sinister than they already seem to me; I have heard of Crowley's work in magic to feel a sense of foreboding for Holly from the start. Jeff might be caught in a mess of drugs, alcohol, and police, but Holly is caught in messy relationships and struggling to make ends meet. Jeff does change over time because he hits his rock bottom. He's lucky in meeting Ron, who is serious about staying sober and helping others through addiction. He isn't quite the callous jerk he seems at the beginning of the novel, and it really is a credit to Earl Javorsky that I can empathize with Jeff's situation and the strain his family is under. As Jeff changes, we see more of his ties to others, and that he truly can rebuild his life. Ron and his detective friend Joe really do help flesh out the investigation into the suicides and the tie to the self-help group. Once the connections are made, the story's pacing picks up considerably and the pages flew by. 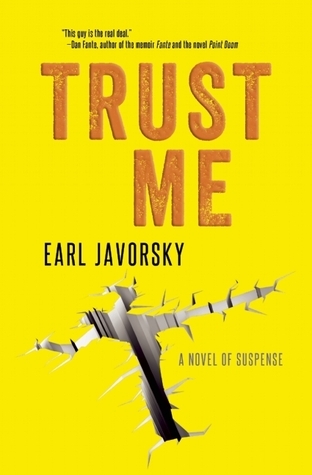 This is a fun thriller to read, as odd as that might sound; some thrillers leave me feeling tense not only while reading them, but afterward as I'm left in the aftermath of the story. In this one, everything seems to pull together in a way that is fitting, and I'm satisfied with how it turned out.